Following The LEGO Movie 2: The Second Part debuting at #1 at the box office last weekend, the LEGO Group is announcing three additional sets based on key characters and moments from the film. 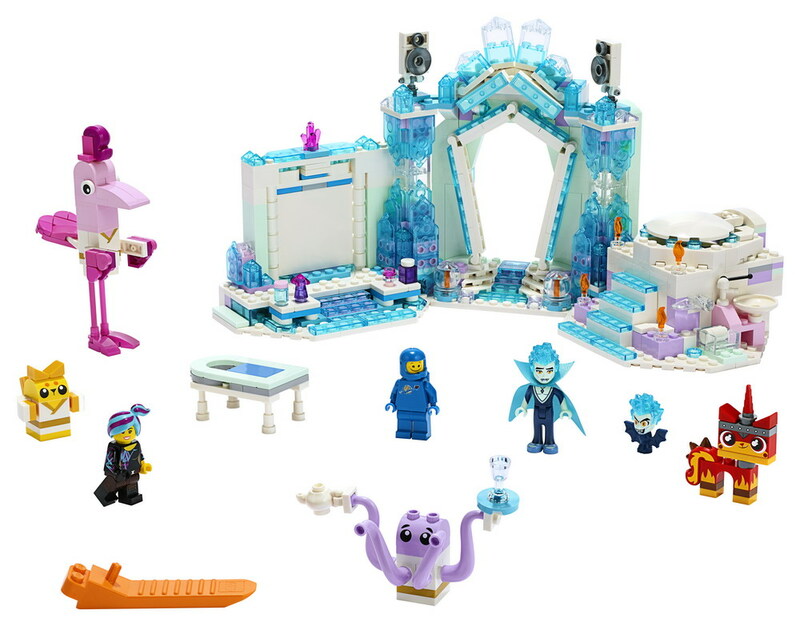 Unveiled in advance of New York Toy Fair, the three sets, Emmet’s Triple-Decker Couch Mech, Queen Watevra’s ‘So-Not-Evil’ Space Palace and Shimmer & Shine Sparkle Spa!, will be available this Spring. The full portfolio of sets based on the smash sequel now totals 25! Create a cool triple-decker couch with THE LEGO MOVIE 2 character Emmet! Take a seat on the super-tall buildable couch and have a drink with Unikitty as Rampage Kitty. But beware—Sweet Mayhem could attack at any time. So show off your master-building skills to rebuild the couch into an amazing mech! Get in the driver’s seat and flap the ladder wings. Spin the gear wheel and grab Sweet Mayhem with the claw. Then celebrate by having another mug of coffee. There’s so much fun to be had with this awesome LEGO building set! • This THE LEGO MOVIE 2 toy building set includes an Emmet toy minifigure, Sweet Mayhem mini-doll figure and new-for-May-2019 brick-built LEGO Unikitty as Rampage Kitty figure with a bushy tail. • This 2-in-1 LEGO building set features a triple-decker couch that can be rebuilt into Emmet’s couch mech. • Triple-decker couch features 6 detachable mug elements and ladders on each side. • Emmet’s couch mech features a top-deck minifigure seat with mug elements as driving ‘controls’, posable arms, legs and feet, spinning gear wheel ‘hand’, gripping claw, and adjustable ladder wings. • Includes Sweet Mayhem’s blaster. • Accessory elements include Sweet Mayhem’s adjustable wings, helmet and boosters. • Kids can recreate fun scenes from THE LEGO MOVIE 2 with this master-building Emmet LEGO set. • Triple-decker couch model measures over 5” (13cm) high, 3” (9cm) wide and 1” (4cm) deep. Join THE LEGO MOVIE 2 characters Benny the spaceman, Washed-out Wyldstyle and Unikitty as Calm-Down Kitty at the Shimmer & Shine Sparkle Spa with this colorful playset! Enjoy a massage by Eight the octopus. Relax in the hot tub with Calm-Down Kitty. Check out Washed-out Wyldstyle’s new hairstyle—everyone likes it except her! But beware—all is not what it seems here in the Systar System. That hot tub has a trapdoor. And when Balthazar transforms into a vampire bat, you better get out of there! • This kids’ toy LEGO set includes 8 characters from THE LEGO MOVIE 2: Benny and Washed-out Wyldstyle minifigures, Balthazar mini-doll figure, plus brick-built LEGO Unikitty as Calm-Down Kitty, Flaminga, Eight, Archimedes and Balthazar vampire bat toy figures. • Shimmer & Shine Sparkle Spa features an arched entrance, buildable loudspeakers, lever-operated revolving wall for Balthazar to ‘transform’ into a vampire bat, hot tub with an opening lid and trapdoor function, buildable sink, 2 removable tables, 6 brick-built potion bottles and assorted elements including a towel, teapot, cup, serving tray and translucent crystal decorations. • Also includes a buildable massage table. 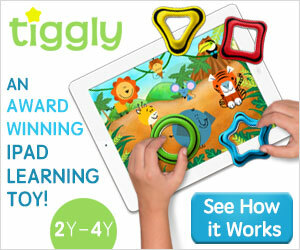 • Flaminga figure features posable wings and tail. 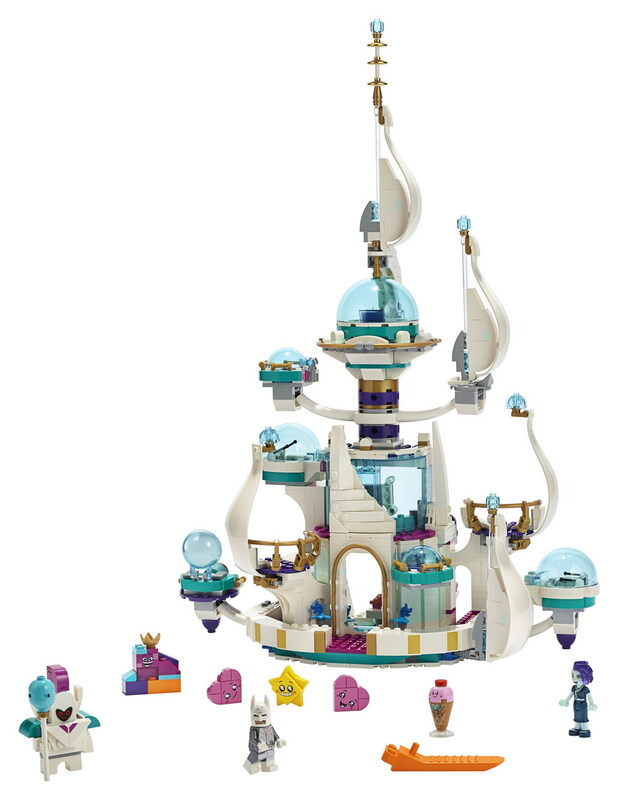 • The minifigures, mini-doll figure and brick-built figures in this set are all new for May 2019 and the Washed-out Wyldstyle minifigure features blue and pink hair while the Unikitty as Calm-Down Kitty toy figure has a new face expression. • Kids will love recreating fun-packed scenes from THE LEGO MOVIE 2 with this popular toy playset. • THE LEGO MOVIE 2 toy spa measures over 5” (14cm) high, 12” (31cm) wide and 4” (12cm) deep. Join Bachelor Batman and Queen Watevra Wa’Nabi for dinner at the queen’s ‘So-Not-Evil’ LEGO Space Palace with this fun-packed building set! Enjoy a smoothie and check out the DJ booth. Meet other colorful THE LEGO MOVIE 2 characters like Ice Cream Cone and launch the Stars and Hearts into space in their pods. Then make the top of the palace spin as Queen Watevra Wa’Nabi takes off in her super space rocket toy! • This LEGO palace set includes 9 characters from THE LEGO MOVIE 2: a Bachelor Batman minifigure and Celeste mini-doll figure, plus Queen Watevra Wa’Nabi, Ice Cream Cone, 2 Star, 2 Heart and Royal Guard brick-built figures. • The multi-level palace toy features a rotating top section with an opening, detachable rocket for Queen Watevra Wa’Nabi, detachable opening pods for other characters, 2 balconies, security room with a buildable security screen and assorted elements including a coffee cup, small heart and donut, and a dining room with a table, 2 seats, sideboard, buildable smoothie maker, assorted food and drink elements and a DJ booth. • Also includes the Royal Guard’s buildable lollipop. • Bachelor Batman minifigure (with special suit decoration), Celeste mini-doll figure, Queen Watevra Wa’Nabi (small version), Ice Cream Cone (small version) and Royal Guard figures are all new for May 2019. • Kids can recreate fun-packed scenes from THE LEGO MOVIE 2 with this cool palace toy building set.